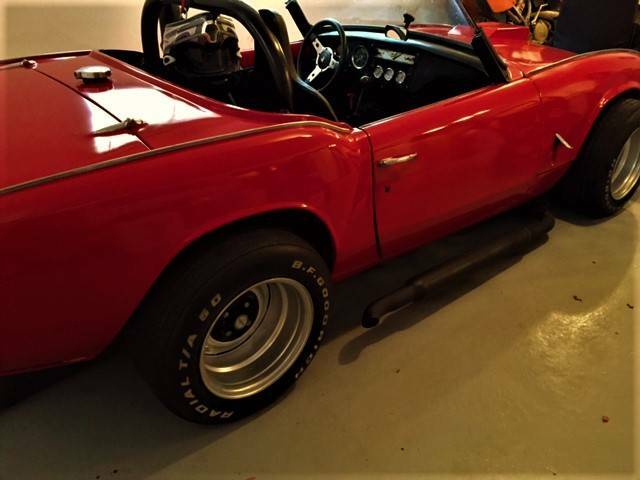 The Triumph Spitfire was a diminutive, featherweight, two-seat sports car assembled in Coventry, UK from 1962-1980. A competitor of the Austin-Healey Sprite & MG Midget, the Spitfire was only available with a small inline four cylinder engine and didn't get the bigger inline sixes available to the GT6 or TR6. Don't worry, lots of folks over the years figured out how to shove the extra two cylinders into the Spitfire body, but today this next car has an extra 4 cylinders shoved under the hood. 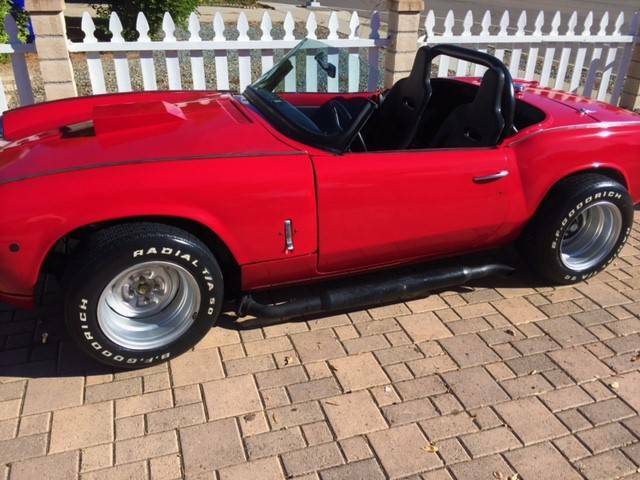 Find this 1969 Triumph Spitfire V8 offered for $10,000 in San Diego, CA via craigslist. Tip from Rock On! Well now you can! This little red hot beauty features a 1961 Hi Compression all aluminum Buick V-8 with an Elderbrock 4 barrel carb, race cam and headers and it weighs less than the ol 75 HP 4 banger! This car also has side-pipes that sound so good you wont need a stereo! Sporting over 200 horsepower and a GM 4 speed stick, it smokes 50 series BFGs like cigarettes- Even 4th gear can be "interesting!" Just FYI- You must be a bona-fide gear head for this one! I won't sell to your teenager. And NO- it would not be a good first car. 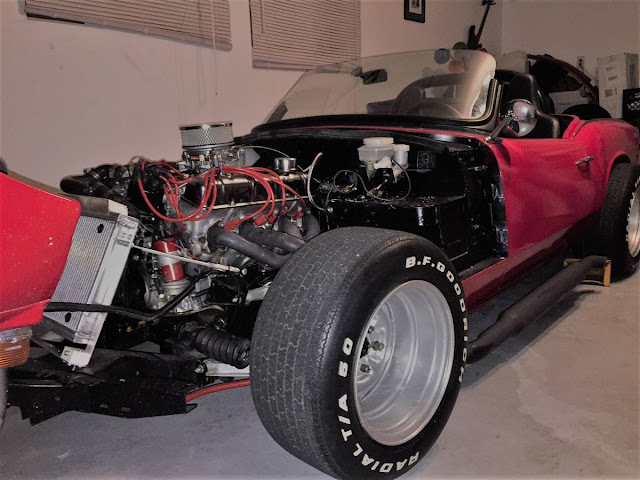 Back to the specs: Brand new poly bushings, KYB front gas struts, new corvette rear air shocks, Champion (race) radiator with dual electric fans. The top end was done recently with a new comp race cam, lifters, head gaskets etc. New light weight racing seats with Simpson belts, battery relocated to the truck. The body has a nice paint job as you can see, with very minimal rust as its been indoors most of its life. This Triumph has been stripped of all extra weight like heater, side windows, regulators, top etc. Its a One Purpose Build. I need the space. This little monster fires right up, drives, shifts, brakes etc. its about 90% done. We can drive it around the block. It is currently registered. It never needs smog. What it needs: Alignment, better tires (old and some cracking) a better (ie: longer throw-clutch release system -Brand new $200 Novak system included) the diaphram, disc and bearings are already brand new and basic safety check and fine tuning. Im looking for approx 9-10k. May consider partial or full trades for 4x4 truck or Jeep, Off road toy, corvette, classic car or something that adds up to 10K? Cash buyers are 1st priority, will negotiate in person only. Call or text now: 619-933-forty 56. I wonder how close to driving a Cobra this experience is? I am into this creation. I haven't seen those tires since the early eighties. They have be older than many of the readers! Needs the space but will take anything on wheels as a trade!